Paul Duncanson, W5MMT, HS0ZAC demonstrates the Alexloop antenna at the meeting on August 5, 2012 at N-Siri Resort & Hotel. 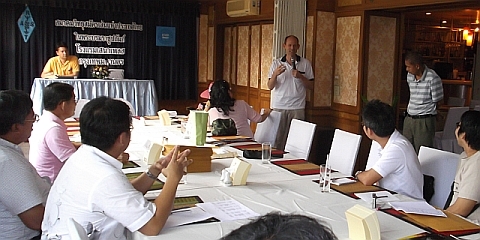 RAST held its August monthly meeting at the N-Siri Resort & Hotel in Lumlukka which was attended by over 40 members and visitors, providing an opportunity for members to visit the location of its new HS0AC club station and to familiarise themselves with the facilities at the resort, which is just to the north of Bangkok. 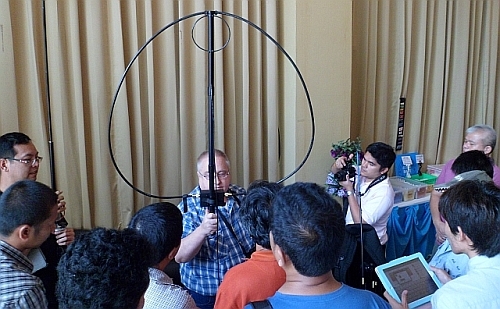 Several members took this opportunity to bring antennas for assembly and display, including HF Yagi antennas, antennas for 6 metres as well as some mobile loop antennas for the HF bands that were tested from the next HS0AC club station location on the fourth floor of the hotel's tower building. RAST President Pornchai (Joe), HS2JFW began by thanking the proprietor of the N-Siri Resort & Hotel, "Mor Dong" (Dr Dong), E20MIO who can be seen in the picture below at the operating position in his shack. 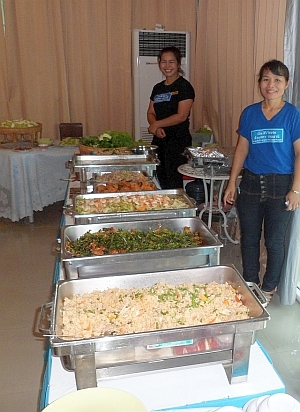 Dr Dong has offered a room for a club station to RAST for a very favourable rental fee and the resort provided a function room for the RAST meeting and buffet luncheon on this occasion. First-time visitors to the meeting included E21SP, E22JQM, E22UWN, HS4FYJ HS6XEQ, E27EZG and E21LXK, several of whom had recently received their intermediate class licences from the NBTC after passing the Intermediate Class exam conducted by RAST in May. Dominating the announcements during the meeting were summaries of the CQWW VHF contest last month in which several club stations were able to operate in the 6-metre band after this had been authorised by the National Broadcasting and Telecommunications Commission (NBTC) in response to a RAST request. 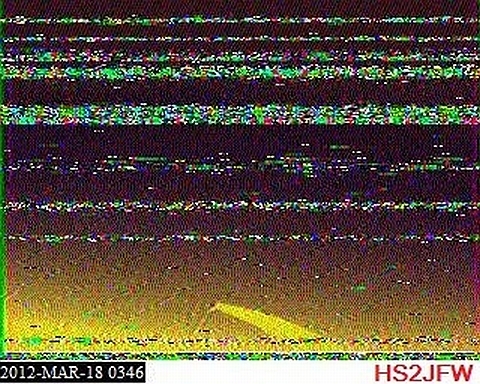 (See this clip of HS5AR's SSB pile-up recorded in Japan on YouTube). Champ, E21EIC, Joe, HS2JFW and HS6XEQ provided accounts of operating on 50 MHz during the contest, speaking about sporadic openings and of times when there was limited propagation -- such as only to northern Japan in the morning, but to southern Japan in the afternoon, while at times the band had been open to Japan from northern Thailand -- but not from the central area of Thailand including Bangkok. 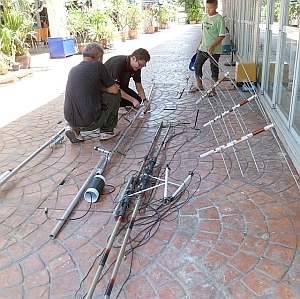 Champ, who is the Thailand representative of the CQWW VHF contest committee, reported that HS0AC, with a six-element Yagi, had made 180 QSOs, while HS5AC in Chiang Mai had made 150 QSOs on six. HS4AK in Khon Kaen had made 38 QSOs and HS1AR in Saraburi 50 QSOs, including 23 grid squares. 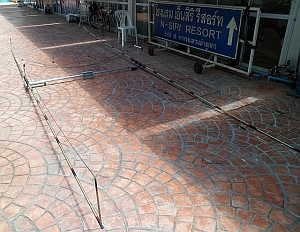 Another station in Bangkok using the callsign E2E from John (Narissara), HS1CHB's QTH with a home-built 5-element Yagi had suffered a power outage, as guest operator Toshio, JA1WTI recalled during the meeting. In all, there were several accounts of operations. Joe, one of the HS0AC operators, said there had been attempts work Europe with the beam in that direction, but without success, while other attempts were made to contact two stations in the Philippines -- but despite both stations beaming at each other nothing could be heard. Similarly, no stations in Australia were copied during the contest, even when the beam had been pointed in that direction and after calling CQ. 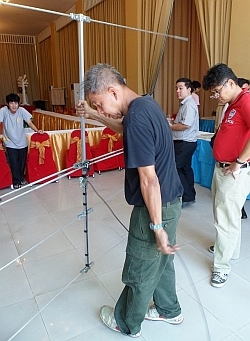 A question was asked as to when the next operation on six metres might be and Champ said that this would probably be during the Thailand Field Day contest next February, while Toshio observed that the best time of the year to work DX in Asia and Europe on six metres would be during the months of May and June. As for the next VE exam, Joe announced that this would be conducted later this month at the NBTC Secretariat on Phaholyothin Soi 8 (Soi Sailom) on a working day when NBTC officials would be invited to witness the exam as observers. Since last year, the NBTC has equated US General or Advanced Class amateur radio licences to the Thai Intermediate Class licence, but had expressed a desire to witness the exam process themselves. Joe, HS2JFW said that hopefully those who would passed this VE exam later this month would be able to upgrade to an Intermediate Class Thai licence on the spot and receive this on the same day. The exact date of the next VE exam has not been finalised but it would likely be on August 21 or August 22 and information about this will be updated at e21eic.net and at the RAST Thai-language web site as soon as this is known. The next Intermediate Class licence examination may take place at the Bangkok University campus in Pathum Thani on November 10 -- but RAST is still waiting for confirmation of this from the NBTC, which so far has only acknowledged its request to conduct the exam. If granted this exam will take place in parallel with a planned novice class examination on that day and an update about this will be posted on the RAST English-language and Thai web sites as soon as this can be confirmed. Earlier this year, a team of Thai and foreign hams conducted EME activity from Thailand led by Karsten, HS0ZIL, along with Swen, HS0ZFZ, Juthathip, HS3SAD, Joe, HS0ZGQ and Bob, HS0ZFD with the aim of raising funds for HS0AC and at the meeting Joe announced that RAST had received a donation from Karsten of a cheque for US$400 (some 12,600 baht) from this activity. Next month, during the September RAST meeting, Swen would make a presentation about this activity, the RAST President added. RAST Liaison Officer Tony, HS0ZDX who provides an English summary of announcements during RAST meetings, also thanked the International Amateur Radio Union (IARU) Region 3 Association for its promise of a donation of US$1,000 to help RAST build a new antenna tower and to put up an antenna at its new station location at the N-Siri Resort & Hotel. The following quote was made by IARU Region 3 Chairman Michael Owen, VK3KI in the IARU Newsletter (April to June 2012 edition) entitled "9V1UV Selva�s Special Fund": "It may be recalled the former Director 9V1UV OM Selva had made a generous contribution of US$ 5000.00 to be used by the Directors for special projects. No formal guidelines were made for utilising this fund. "We have not received any requests from any society for a contribution from this fund so far. "Considering that the entire club station of RAST was destroyed by flood, the directors have decided to make a contribution of US$1000.00 to RAST from Selva�s fund to help rebuild the station and more particularly towards the cost of a tower and antenna to be erected at a new location they have decided upon." RAST is most grateful to the IARU Region 3 Association for their support as well as to Karsten and his group and, indeed, to everyone who has donated to the society so far to help its efforts to build up a stronger and better club station for ongoing contest and demonstration activities. To date, over 400,000 baht has been received and a summary of the donations received so far can be found here. 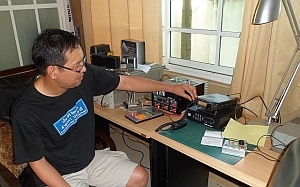 This month, Toshio will be taking QSL cards from RAST for JA contacts with the HS0AC and E2E club station operations to the JARL Ham Fair in Tokyo where he will make an appeal to Japanese radio amateurs and organisations for donations to help RAST's club station. During the August meeting there was a question from the floor asking if there had been any progress by the NBTC with its 2012 draft band plan which includes 6-metres along with a bigger allocation for 2-metres as well as additional spectrum on 70cm (430-440MHz) and on several UHF bands. Joe responded by saying that RAST had joined in recent Focus Group meetings and that details were still being discussed by the NBTC -- but that there were concerns by the commission about assigning shared spectrum under primary and secondary usage requirements. The RAST President said that the NBTC preferred to have exclusive frequency assignments to avoid interference problems -- but yet still might consider allocations on a secondary basis by authorising only intermediate class radio amateurs to use additional spectrum on this basis initially. If a decision were to be made quickly, the new band plan allocations might be announced this year, although he indicated that next year or even the following year, when RAST would be celebrating its 50th anniversary, were more likely for this to happen. What could be more likely would be for radio amateurs to receive a limited part of the spectrum in some bands, such as 435-438 MHz in the 70 cm band (430-440MHz) after the NBTC had moved other users out of this portion of the band. Time, of course, would tell, Joe added. After the main meeting concluded at around 2.30 p.m. some members visited the new club station operating room atop the four-storey tower at the N-Siri Resort & Hotel. 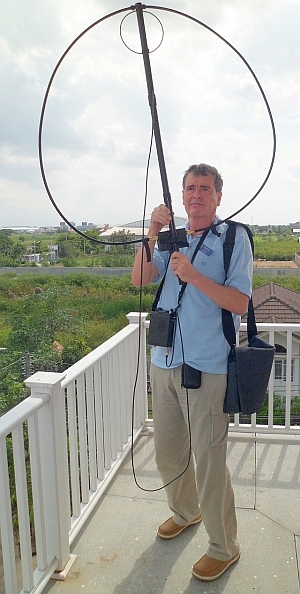 There, Tony, HS0ZDX (pictured at right), with a portable Alexloop antenna borrowed from Paul Duncanson (W5MMT/HS0ZAC), monitored the 15-metre band while standing on the balcony next to the operating room-to-be and he was able to copy S9 signals from both SP3DOI in Poland and VR2XMT in Hong Kong in a QSO and with very little background noise or interference. This was definitely a good endorsement of the station location and, based on popular support from those attending the August meeting, the next RAST meeting will also be at the N-Siri Resort and Hotel and members will also be notified of this by an email a few days prior to the meeting. If you are not on the RAST mailing list but would like to be to receive occasional messages please send a request to tony(DOT)waltham(AT)gmail(DOT)com. Thailand's National Broadcasting and Telecommunications Commission (NBTC) Secretariat has approved a RAST request that use of the 50-MHz (six metre) band be permitted during the CQ World Wide VHF contest on the weekend of July 21-22, 2012. The permission is for the RAST club station HS0AC and for other amateur radio associations' monitoring stations in the provinces. RAST had also sought permission from the NBTC for Intermediate Class operators to use their home stations on this band and later sought a clarification about this from the NBTC. The NBTC responded by saying: "Intermediate class stations are not yet authorised to use the 50 MHz band." But they added: "permission to operate in this band will be granted in the near future." The NBTC states that everyone using the 50-MHz band during the contest must closely comply with the amateur radio regulations of 2550 (2007) and operators must submit a log book of their contacts to the CQWW VHF contest committee for Thailand for submission to the Office of the NBTC. To meet this request, every station operating on six metres during the CQWW VHF contest should send an electronic version of their contest log to Champ, E21EIC, at e21eic(AT)gmail(DOT)com. Amateur radio stations in the provinces who intend to operate on 50 MHz during the CQWW VHF contest are asked to regiater with RAST here and to contact the society at hq(AT)rast(DOT)or(DOT)th for information about the conditions for operating on this occasion. RAST will conduct an online seminar on July 19 at 19.00 to provide information to help operators of club stations who intend to take advantage of the NBTC's permission to operate during the CQWW VHF contest. Full details about this and how to sign up can be found at the RAST Thai-language website. 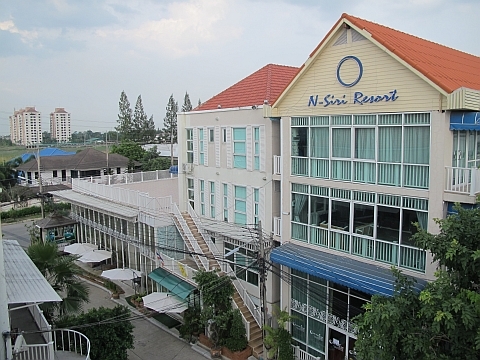 The N-Siri Resort & Hotel in Lumlukka where RAST has been offered a room on the fourth floor for use as a club station. The August meeting of RAST will be conducted there so that members will have an opportunity to familiarise themselves with the location. 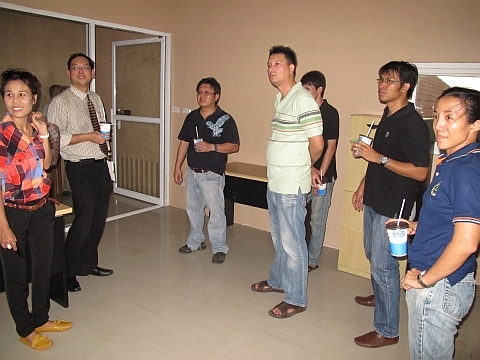 RAST President Pornchai (Joe) (centre) accompanied by committee members and other representatives from RAST survey the proposed operating room on the fourth floor (atop the building shown below). They are seen here with the owners (at left). Members present at the July RAST meeting at Sena Place Hotel heard about plans for conducting the next Intermediate Class amateur radio examination, received an update about the status of the HS0AC club station at the Asian Institute of Technology (AIT) and learnt of plans to open a second RAST club station at a resort in the northern suburbs of Bangkok. The meeting, headed by RAST president Pornchai (Joe) Semjang, HS2JFW also welcomed several guests and visitors including E22JZH, HS1EJE, HS1QDX and Chiang Mai radio association President HS1LCI, Thiradej along with "returnee" former member Victor Batchelor, G3TTG, and who had last attended a RAST meeting 27 years ago and Sutichart, E22BIG, who had previously attended a RAST meeting some four years ago. The formal part of the meeting began after lunch with the presentation of a WRTC 2014 cap to Champ, E21EIC by Charly, HS0ZCW as a token of encouragement and support for his possible selection for "the Olympics" of amateur radio, the World Radiosport Team Championships (WRTC) that will take place in New England, USA in two years' time. The WRTC is held every four years and consists of around 50 two-person teams of amateur radio operators competing in a test of operating skill from stations with identical antennas and from the same geographic region. Champ had been selected to participate in 2006 when it had taken place in Brazil. RAST President Pornchai (Joe) HS2JFW explained that there had been many activities over the past month including a survey of the HS0AC club station on the campus of AIT to the north of Bangkok which had been severely damaged by flooding in October and November last year. The RAST President along with a group of a dozen or so RAST committee members and helpers had travelled to the AIT campus on June 23 to check out the station and to see what work needed to be done as well as to do an inventory and a clean-up. 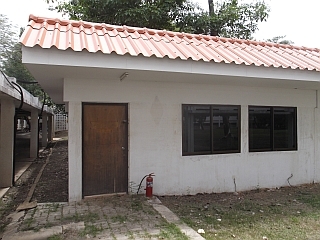 After inspecting the building they concluded that, at the very least, new doors were needed for the main entrance and the bathroom, while the interior needed painting, while a complete set of furniture would be required. The pictures at left show the exterior of the shack in the lower picture while the interior view above shows 15 transceivers that were damaged beyond repair by flood water last year and clearly depicts the need for a paint job. The electricity was functioning, but no air-conditioning was being provided to the building as it had been previously. After making enquiries, RAST has received a quote from AIT for more than 10,000 baht for the new doors and for repainting the interior, while it is still awaiting a reply about the status of the air-conditioning or when the service might be resumed. Next came some "good news," as Joe referred to the group's assessment of a new location for a second RAST club station at the N-Siri Resort and Hotel in Lumlukka which is closer to the city and easily accessible from the Kanchanapisek eastern ring road. This has been offered to RAST by the resort owner, who is also a radio amateur, where a large air-conditioned room on the fourth floor of the resort will serve as the club station. There is accommodation there should operators wish to stay overnight along with a restaurant that is open 24 hours a day, plus a swimming pool and other facilities. Meanwhile, Tony, HS0ZDX and Sam, HS0ZDY (seen here at right) subsequently checked the location for any interference or line noise and they found it to be very quiet. The hotel, which also caters to events, seminars and weddings, has several function rooms and it was agreed with a show of hands during the July meeting that the next RAST monthly meeting which will be on August 5 will be conducted at N-Siri Resort & Hotel. A map and directions will be posted on this website and also at the RAST Thai-language website. The RAST President also announced the results of the Intermediate Class examination with 42 candidates passing the exam to become operators with HF privileges and Joe also noted that RAST had received much praise and gratitude for conducting the exam in a fair and responsible way from National Broadcasting and Telecommunications Commission (NBTC) staff and from many of the candidates who had taken the exam, both those who had passed and from those who had failed -- but who said they would return to sit the exam again. 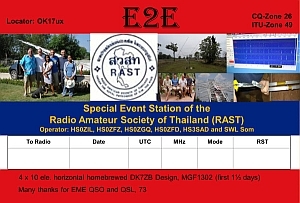 As for this second group, their next opportunity may be on November 10 in Pathum Thani, just to the north of Bangkok, when the Pathum Thani Amateur Radio Association is organising an amateur radio novice exam and has agreed to allow RAST to supervise an intermediate class exam that will be conducted simultaneously. Permission is now being sought for this from the NBTC and RAST is waiting for their approval and hopes it will be able to confirm this. 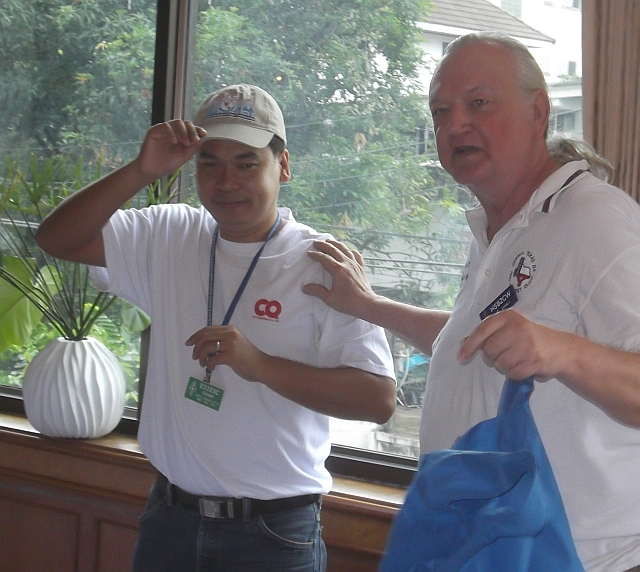 President of the Chiang Mai Amateur Radio Association Thiradej, HS1LCI (pictured left) also said at the meeting that Chiang Mai would also be keen to conduct an intermediate class exam in the near future and would discuss this further with RAST, which has offered its full support. In another activity that took place over the previous month, RAST President Joe and five other committee members attended a "Focus Group" meeting on June 30 organised by the NBTC's Subcommittee for the Development of Amateur Radio when RAST received a lot of respect and support, being seen as the leader by representatives of other amateur radio associations present. Adviser to RAST Thida, HS1ASC observed at the July meeting that RAST "has received much praise and appreciation" from the NBTC, its officials and from amateur radio associations in districts 1, 2 and 7 who were attending the Focus Group meeting and they had also spoken highly of Joe's presentation, she said. Paul Duncanson, W5MMT, addresses the July meeting of RAST when he offered many constructive suggestions for promoting amateur radio, particularly by promoting inexpensive kits to encourage young people to build equipment. Paul Duncanson, W5MMT/HS0ZAC suggested that RAST might organise an annual hamfest, and he asked how many radio hams were there in Thailand? To which Thida, HS1ASC replied that over 200,000 Thai hams were now active. Paul stressed the importance of influencing young people to join the hobby of amateur radio and he stressed the benefits of relatively inexpensive kits that they could build and of SDRs (software defined radios). Young hams were the future, he said, adding that all too few people today took the Internet for granted and did not realise the importance of the resource that amateur radio operators provided, particularly during disasters. Paul, W5MMT now spends much of his time at his home near Khao Yai National Park which is not far from Nakhon Ratchasima and he said he would like to help the local amateur radio club there by donating equipment, while also suggesting that RAST should try to have some of the key ARRL amateur radio textbooks translated into Thai and possibly should set up a library. Paul also made a generous donation of 10,000 baht during the meeting to help the RAST club station HS0AC to get back on the air. 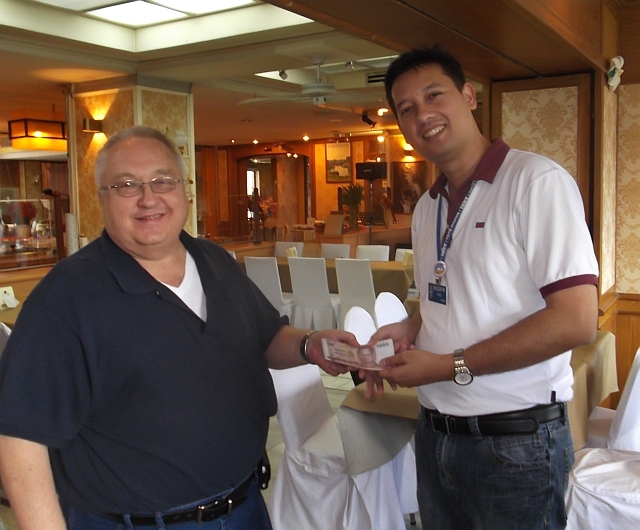 RAST President Pornchai (Joe, HS2JFW) gratefully accepts a cash donation from Paul Duncanson (W5MMT) to help RAST recover its HS0AC club station. Thida, HS1ASC also reminded those present of two major regional amateur radio events taking place later this year, the IARU Region 3 Conference in Ho Chi Minh City from November 5-9, 2012 and the 40th SEANET Convention in Kuala Lumpur from November 23-27, 2012. Thida recalled the recent SEANET Convention in Shanghai, China when she along with Juthathip, the XYL of Swen Roeder, HS0ZFZ had been the only Thais present and so the two of them had to take the stage and address an audience of hundreds with Thai cultural presentations. Thida encouraged a strong turnout at SEANET from Thailand this year in KL and asked those planning to attend to get in touch with her in advance. One topic dominated the May RAST meeting at Sena Place Hotel: the upcoming Intermediate Class examination that will take place on May 19 at Bangkok University's campus in Klong Toey. A total of 250 candidates have applied and registered to sit this exam, which comprises both theory and Morse code. RAST President Pornchai (Joe), HS2JFW, said that a day-long training session conducted by RAST on April 28 to prepare candidates for the exam had been a success and had been attended by over 100, some of whom had travelled from as far as Chiang Mai and Yala Province (See video below). Prior to the meeting on Sunday, May 6 the RAST committee had met to finalize preparations for the examination and during the meeting Pornchai invited RAST members to volunteer to help oversee the examination, asking those interested in helping to contact him. Prior to the meeting RAST committee members had worked through the final organizational details of staging the first Intermediate Class exam to be conducted in Thailand in nine years. Pornchai went on to note that the imminent increase in Thai amateurs with a licence for HF operations made it all the more urgent to get RAST's HS0AC club and contest station back up and running. In October and November, a surge of flood water inundated the station and the entire campus of the Asian Institute of Technology to the north of Rangsit with water that rose rapidly to reach a depth of around two metres -- as photographs on the lower half of this web page bear testimony. Although equipment had been placed as high as possible in the station "just in case", this had not been high enough -- the water almost reached the ceiling -- and damage to equipment has been severe. 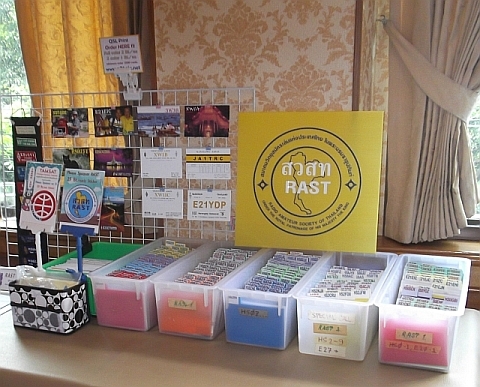 However, thanks to the generosity of many friends of RAST who have donated both funds -- now amounting to over 300,000 baht -- and equipment, RAST now has new transceivers that are ready to go on the air so the first priority after the Intermediate Class exam would be to renovate the existing station and get it back on the air, the RAST President said. Indeed, at the May meeting a RAST life member who had not come to a meeting for several years, Paul Duncanson, HS0ZAC and W5MMT (pictured left), announced that he was retiring soon and as a gesture of support to help RAST recover from the severe flooding he would donate a top-of-the-line Yaesu FTDX5000MP transceiver to the society -- to a big round of applause by members in gratitude for this promise. 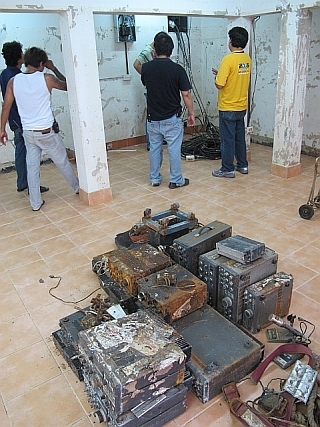 Pornchai said that after the exam there would be a detailed survey of the damage to the operating room, followed by efforts to clean up and bring in new furniture and enough equipment to get back on the air since the antennas atop three towers at AIT are intact. This would be the first step in order to get the club station back on the air as soon as possible, while RAST would also evaluate alternative locations for a longer-term plan and consider opening a club station for demonstration purposes at the centrally-located Klong Toey campus of Bangkok University. 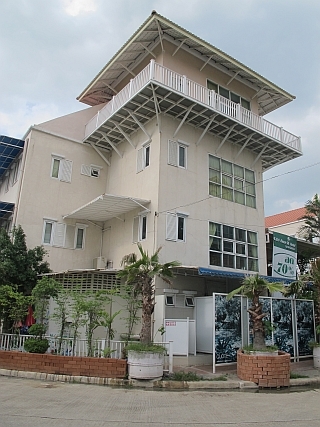 Another location that would be investigated is at Panichakarn Rajdamnoen Sports Club on Buddhamonthon Sai 3 to the west of Bangkok where there is already a club station active on VHF and satellite, but not HF, Pornchai explained. RAST intended to follow-up on an invitation to evaluate this location, which would include an operating room on the 4th Floor, as an alternate or secondary location for the RAST club station, he added. There was also input from members who suggested that the noise level be checked closely if this would become a contest location, while RAST was urged to draw up a sound contract that would be signed by both parties if a decision was made. RAST members were also reminded that the SEANET Convention this year takes place from November 23-27 in Kuala Lumpur, Malaysia when Champ, E21EIC has been invited to give a presentation during the plenary session about how amateur radio helped out during the flooding in Thailand last year. RAST is also invited to participate in the IARU Region 3 Convention in Ho Chi Minh City in Vietnam this year from November 5-9 and the society intends to seek a budget from the NBTC to support its expenses and to ensure good representation there. On April 28, RAST organised a course at Bangkok University's auditorium to help some 120 candidates prepare for the upcoming intermediate class examination that is scheduled for May 19 at the university. The speakers included RAST President Pornchai (Joe), HS2JFW/K2JFW, Choon, E20HHK/AG6EN, RAST adviser Thida, HS1ASC/KH6ASC, Nares, E20YLM/NI1M, Pornchai, E20GJW and Weerawat, HS7JJY/KC6UUJ along with Champ, E21EIC/KY1A who drew up the programme. The registrar for the event was E20NKB/AB1PB while the event was organised with support from Sakol, HS1JNB/KD2AXA, John/Narissara, HS1CHB/N9WMS, Time, HS6MYW and RAST Secretary Jakree, HS1FVL/KJ6TJO while the treasurer for the event was Pornpimol, HS0VDX. This YouTube video is by Peeranat (Part) E20PFE/WH6DQS. 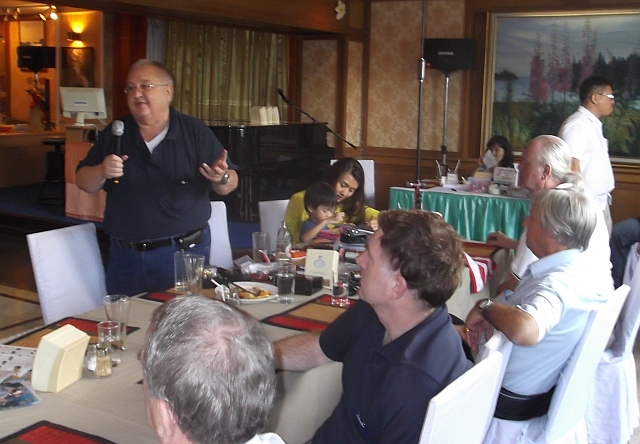 The April meeting of RAST at Sena Place Hotel began with a minute's silence for Charles (Chuck) Kelley, HS0ZCX and W3IAO who succumbed to lung cancer on March 9, 2012 at Bumrungrad Hospital where he had been undergoing treatment for several months. 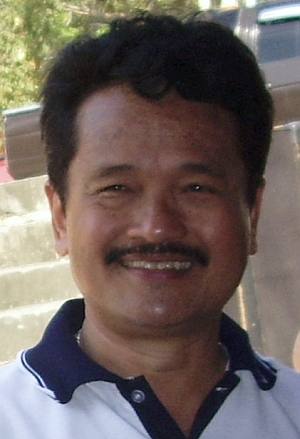 Chuck, who had been 67, was a RAST life member and a long-term resident of Thailand, is survived by his wife, Oy and two sons. May he rest in peace. The meeting was the first to be conducted under the leadership of Pornchai (Joe) Semjang, HS2JFW, K2JFW who had been elected during the March annual general meeting as president of RAST for a two-year term along with a new committee. Following lunch, Joe made several announcements from the podium and fielded questions from members after summarising RAST's activities and listing the new committee members and their responsibilities. A full list of the new RAST committee and their duties can be found here and this line-up is now in the process of being registered with the authorities and will become official within a few days when its status will be updated here as well. There were several new faces at the April meeting, including HS2HS, HS2PQX, HS4PYJ/KD8QQM and Ernesto, KC7MCS an American ham living here who said he had been inspired to join RAST after seeing how hams here had helped out during the flooding last year. Most of the newly-elected and appointed committee members were present at the April meeting, as were former presidents Chaiyong Wongwuticomjon, HS1QVD and Mayuree Chotikul, HS1YL. 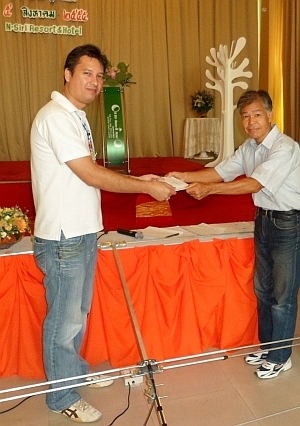 Two Japanese radio amateurs and RAST members, JA2DOU, Toshio, and JE8AXZ, Yoshi, each donated 2,000 baht to RAST to assist in the society's efforts to rebuild and re-equip its club station. In reviewing the activities of RAST under his stewardship for the previous month and looking ahead, Joe, HS2JFW said that the RAST Thai-language web site, www.rast.or.th had seen a major overhaul while RAST was now engaging social media with a Facebook page (http://www.facebook.com/rast.org) and also a presence on Twitter that people may follow. Efforts were ongoing in support of the Japanese bid to reopen negotiations for a bilateral reciprocal amateur radio operating agreement between Japan and Thailand with RAST having sent letters to the Japanese Embassy in Bangkok and to the National Broadcasting and Telecommunications Commission (NBTC) in support of this. Joe praised the NBTC for its active support of amateur radio in Thailand and noted that the national regulator had set up a committee to oversee its development and had appointed RAST advisor Thida Denpruktham, HS1ASC to serve on this committee. He added that several other radio amateurs had been appointed to serve on this committee, including Khun Manas, HS1DE, from the Voluntary Radio Association, along with senior government representatives such as from the Ministry of Science and Technology. RAST would continue to work closely with this committee, he added. So far, some 330 novice class radio amateurs have contacted RAST to apply to be a candidate in the Intermediate Class examination scheduled for May 19, 2012 and application forms are being sent out this month and should be returned by the end of April, which is the deadline for applying. Full details in Thai are at www.rast.or.th while our report about the February meeting has more details. A question pool of 400 questions for the intermediate class exam has been drawn up be a team led by Champ, E21EIC that includes E21IZC and HS8KAY and these questions have been forwarded to Thida, HS1ASC for proofreading and editing, it was announced. The second ballooning activity (MSBAT-2) took place on March 18 and started out in Sai Noi, near Ban Bua Thong, in Nonthaburi and which ended up in Phetchaburi province with more details (in Thai) here. Joe also observed that the CQWW WPX SSB contest had passed in March without participation by HS0AC, regrettably, although several Thai stations were active, including a good effort having been made by Champ, E21EIC. Swen, HS0ZFZ reported activities by RAST members using the callsign E2E, including participation in the ARRL contest and the CQWW WPX contest, while he said this callsign would be used for forthcoming EME (moonbounce) activity on two metres for a period of seven to 10 days in mid-April when four or five RAST members including Bob, HS0ZFD, Karsten, HS0ZIL/DL2LAH, HS0ZGQ and Swen would travel to rare grid squares in northeastern Thailand in an effort to raise funds for HS0AC. 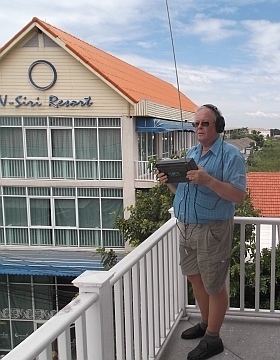 Swen also spoke of a recent EME activity from Vietnam by a group of German radio amateurs and Joe himself worked this station on SSB on two metres, for the first tropo digital QSO between Vietnam and Chon Buri, a distance of 550 kilometres. Meanwhile, Narissara provided an update on transceivers that had been donated or would shortly be donated to RAST and noted that an Icom 7200 transceiver that had arrived from the USA had incurred a 27,000 baht fee for a type-approval inspection. The next examination will be conducted on April 17 in Chumphon province with full details to be found at E21eic.net. The QSL cards for members are made available at monthly meetings by RAST QSL manager Champ, E21EIC, although members who are unable to make it to meetings may opt to receive their cards via the bureau by post. Champ can also help members by print QSL cards and offers several designs as examples as can be seen here.